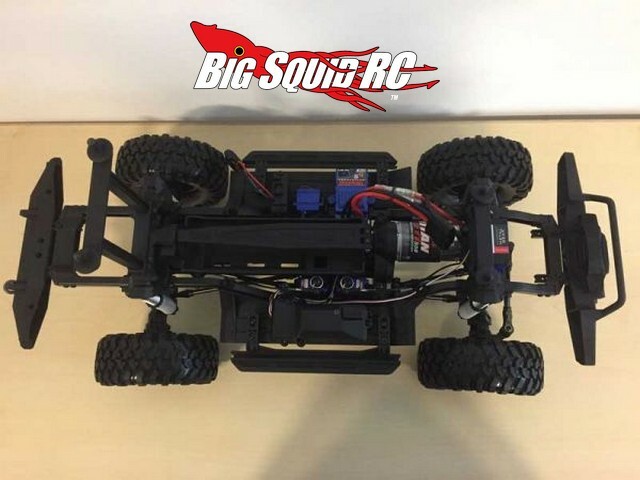 Everybody’s Scalin’ – The Traxxas Scaler « Big Squid RC – RC Car and Truck News, Reviews, Videos, and More! You guys knew I’d be talking about the Traxxas truck this week, right? When I first saw the photos making their rounds last weekend, I actually thought it was a hoax at first. People have done this several times in regards to Traxxas releasing a scaler. It took awhile before I could confirm it was real, but yes, it was indeed. I won’t waste time discussing every little detail surrounding around it, but you and I know it’s going to be a very important release for a myriad of reasons. As of this writing there are no more known details than the pictures circulating from the Nuremberg International Toy Fair show off. Something that many don’t seem to be talking about is the sheer size of it. It looks to be a mammoth rig. It appears to be using 2.2 size tires but keeping the proportions of a smaller 1.9’er so apparently we are dealing with an 1/8 scale goliath. This is freaking awesome. Most of the big trucks you see currently on the market are either comp style vehicles or are something like the Wraith where they use huge tires compared to the rest of the truck. This looks like a traditional scaler, just a lot bigger. Pretty much exactly what I’ve been looking for to tackle gnarlier terrain than the typical 1/10. The portal axles have also been a big point of discussion. Who expected that? They allow for increased ground clearance and one last gear reduction at the wheels. Assuming they are beefy and can hold up to the abuse, it’s an inspired choice. Speaking of beef, that looks to be the theme everywhere on the big Land Rover. It looks thick as hell in all the important places. Traxxas vehicles are known for durability, and at a glance it seems they did not skimp here. The only area I’m skeptical of is what appears to be remote locking diffs. This choice sounds great in theory, but in use I’m not sure why you’d want the diffs to ever be open on a truck like this? This potentially adds a bunch of weight and mechanical complexity for not much gain. I understand why they went that route on the Summit – it was a basher monster truck that could also crawl. Not really sure this will used in high speed bashing, but maybe this truck will be capable of that as well? I guess time will tell. Many people have wanted Traxxas to finally do a solid axle truck, so it’s pretty cool to see that one is almost here- one that isn’t a cookie cutter of other popular trucks to boot! This vehicle is going to be a number 1 priority for us to review just as soon as we can get our hands on one. Until then, stay tuned until more information is announced.